After over a week of use, a couple thousand frames, and well over 5,000 words, my Fujifilm X-T1 review has finally been posted. This is certainly my most comprehensive review to date and I think one of the more comprehensive reviews to hit the web so far. I dived deep into the nitty gritty of the camera, how it compares to Fuji’s other offerings, other mirrorless offerings and beyond. I’ve now had just over a week to play with the X-T1 now so I feel comfortable writing a fairly comprehensive review. I may revisit items after I get one of my own and have even more time to settle in with it. I wanted to have lots of time to go back and forth between the X-T1 and my X-E2 (and even my X100S) to see how the two cameras really stack up against each other. This will go well beyond specs where the X-T1 takes first prize without question. It should be noted that I’m not strictly comparing the X-T1 with other Fujifilm and mirrorless options. There has been a lot of talk about it being the camera to finally bring DSLR owners over to the mirrorless world. This could definitely be true—I made the jump well before the X-T1 was even a rumour—but in the spirit of fairness and accuracy, I won’t sugar-coat how I really think the X-T1 stacks up against my last (semi-)pro DSLR, the D700, and I’ll have the D300 in mind as well. These were both excellent cameras with very good focusing capabilities. With that said, one must be mindful that those bodies cost significantly more, and come with other major disadvantages like size and weight. If you’d like to purchase the X-T1, or anything else for that matter, please consider using one of the affiliate links below. The price is the same for you, but a small percentage of the purchase price goes to me, which helps keep this site going. Thank you. I’m getting this out of the way right up front. 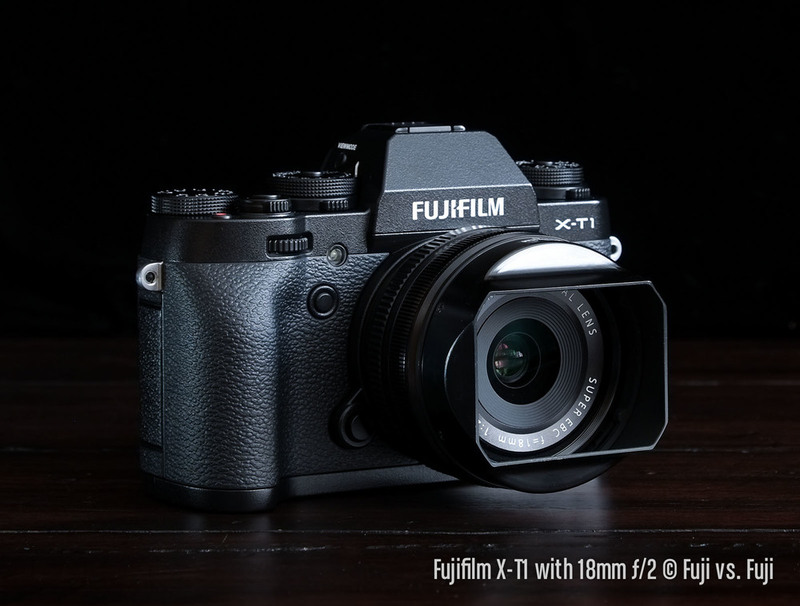 The fact of the matter is, the X-T1 shares the same 16MP X-Trans CMOS II sensor as Fuji’s other recent X Series cameras. Image quality, aside from an extra bump in high ISO capabilities, is a wash.
Having inspected some 100% crops of ISO 3200 and up from the X-T1 and X-E2, the X-T1 doesn’t appear to have made any further advancements in high ISO noise reduction. This isn’t a surprise given how recently the X-E2 came out, and the already excellent noise handling of the X-Trans. I’ll spare you comparing images between the two. 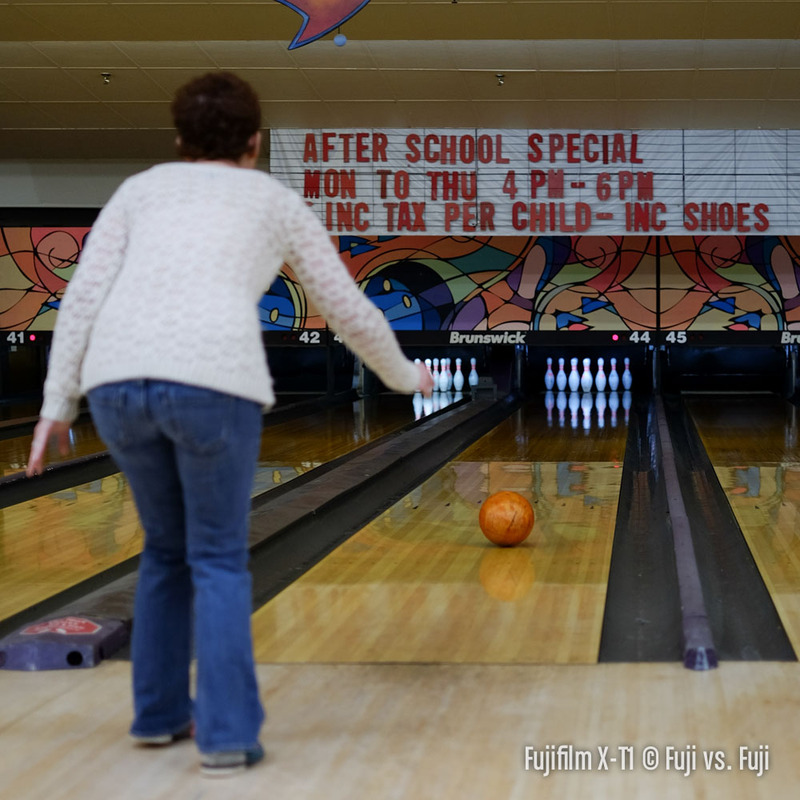 As previously alluded, the X-T1 adds an additional ISO setting; 51,200. This is only accessible if you explicitly select it for either the “H1” or “H2” positions on the ISO dial in Set-up Menu #2 (auto ISO can only be set up to ISO 6400). To cut to the chase, I can’t imagine anyone selecting ISO 51,200. Moving from ISO 25,600, there is a sudden and drastic change in image quality. 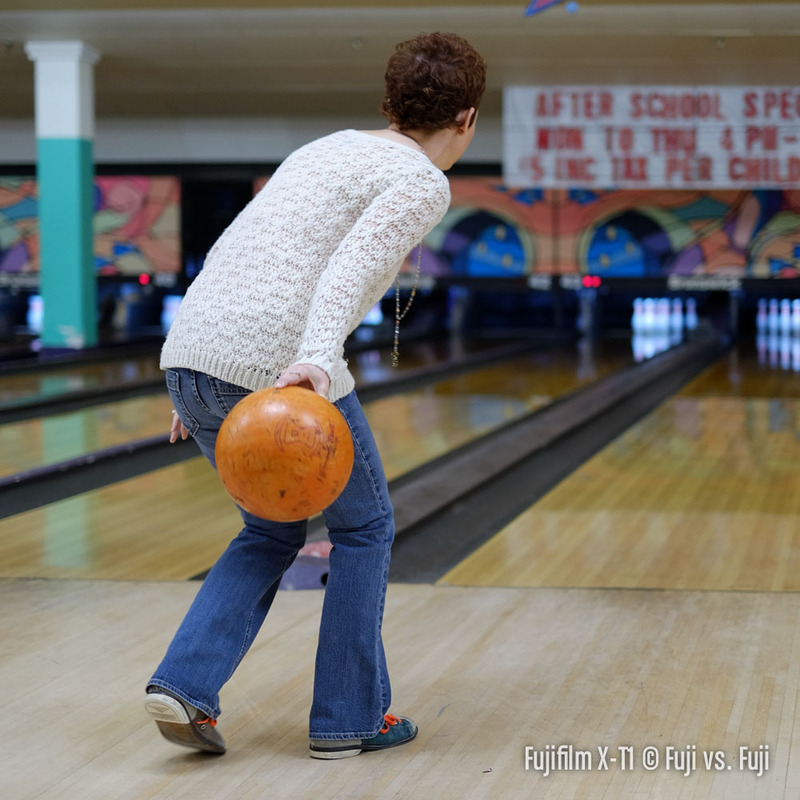 Here’s a sample of images from the X-T1 comparing the noise starting at ISO 3200, and going up full stop increments to ISO 51,200. Click to enlarge. 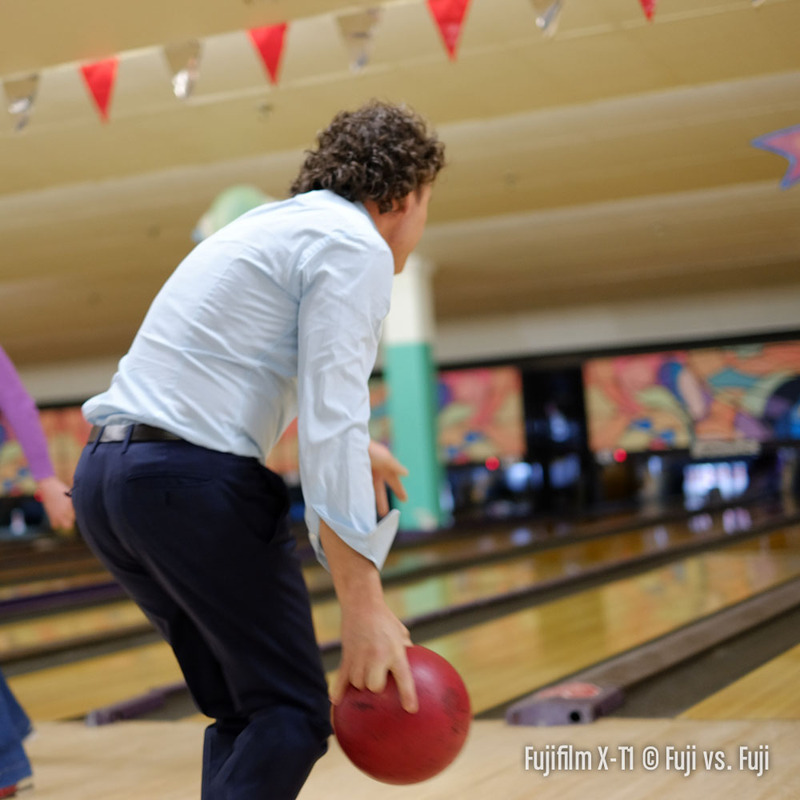 As you can see, ISO 51,200 presents a major shift in colour, and an unusably noisy image. 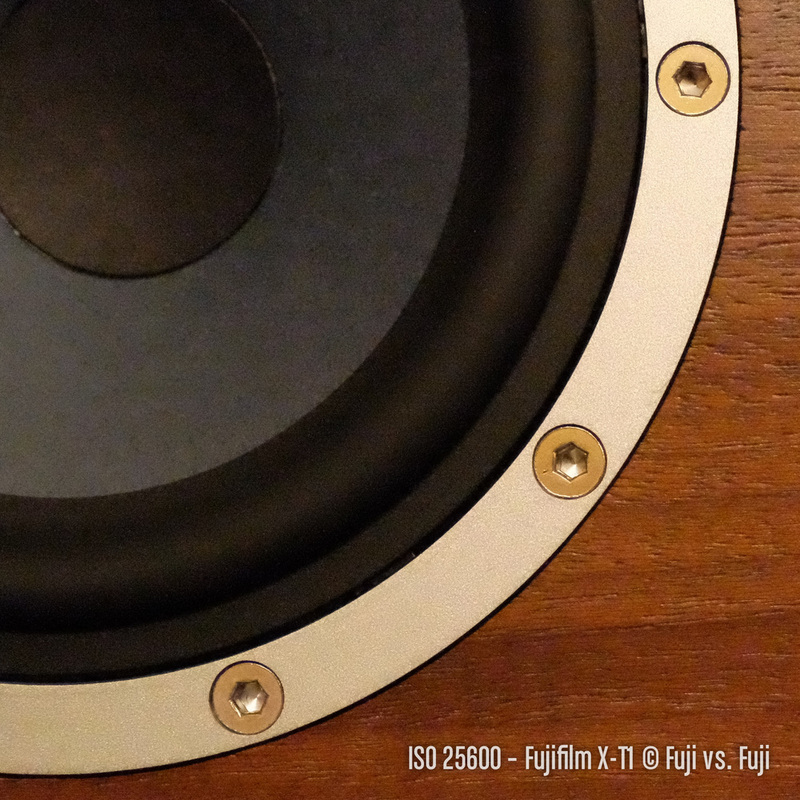 The detail in the wood grain is held very well through ISO 6400. It softens slightly at ISO 12,800 and extremely by 25,600. The silver band around the speaker is a testament to Fujifilm’s noise reduction algorithms. There’s certainly noise present, but there’s virtually no change throughout the images outside of the aforementioned colour shift at ISO 51,200. Pretty remarkable. Fujifilm have been steadily and consistently improving the speed and accuracy of their autofocus performance. 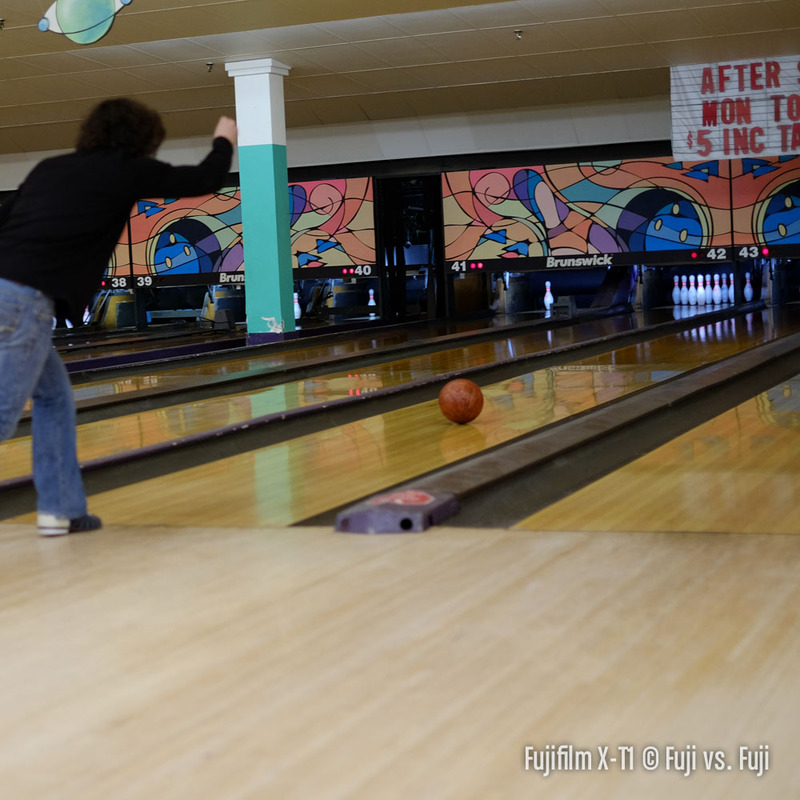 The X100S was an improvement over the X-E1, and the X-E2 was faster still, particularly in low light. 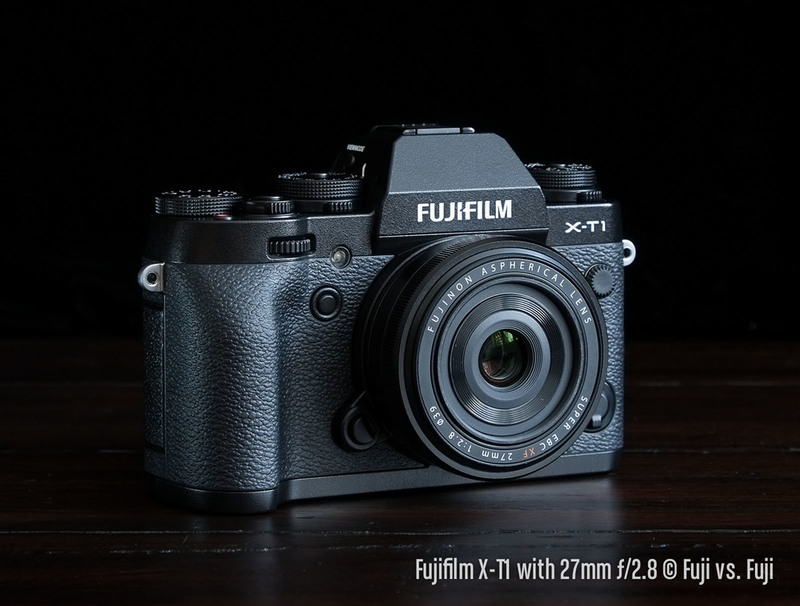 The X-T1 continues the trend and moves up yet another notch in AF performance. We’re not quite to the level of a D700 and pro zoom lens, but it’s getting close. 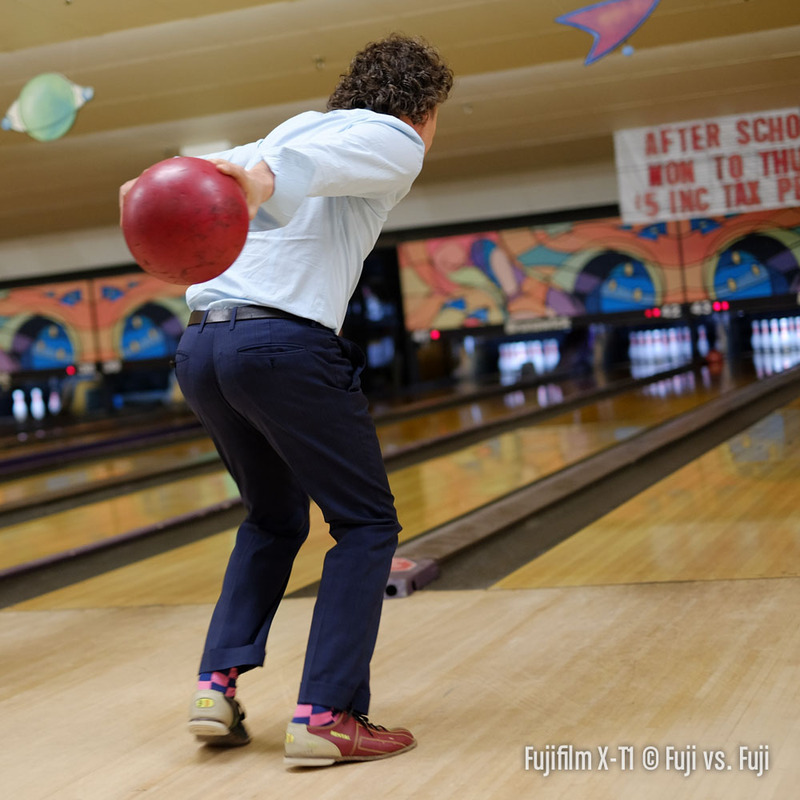 I finally had a chance to put the X-T1’s new AF system through its paces while out bowling with friends and family. The first thing I learned was I am not an action shooter. I get so carried away with tracking something that my composition suffers, badly. The second thing I learned is that the X-T1 absolutely obliterates the X-E2 in continuous AF and tracking capabilities. To be honest, I hadn’t even tried the focus tracking with the X-E2 before. I didn’t have a reason to. I figured that this would be a fairly hot topic though so I wanted to give it a shot. For the most part, I would say my ability to track a subject let me down more than the autofocus system did. One reason for this is a noticeable lag in the EVF while trying to track a moving object and shooting at 8 frames per second. 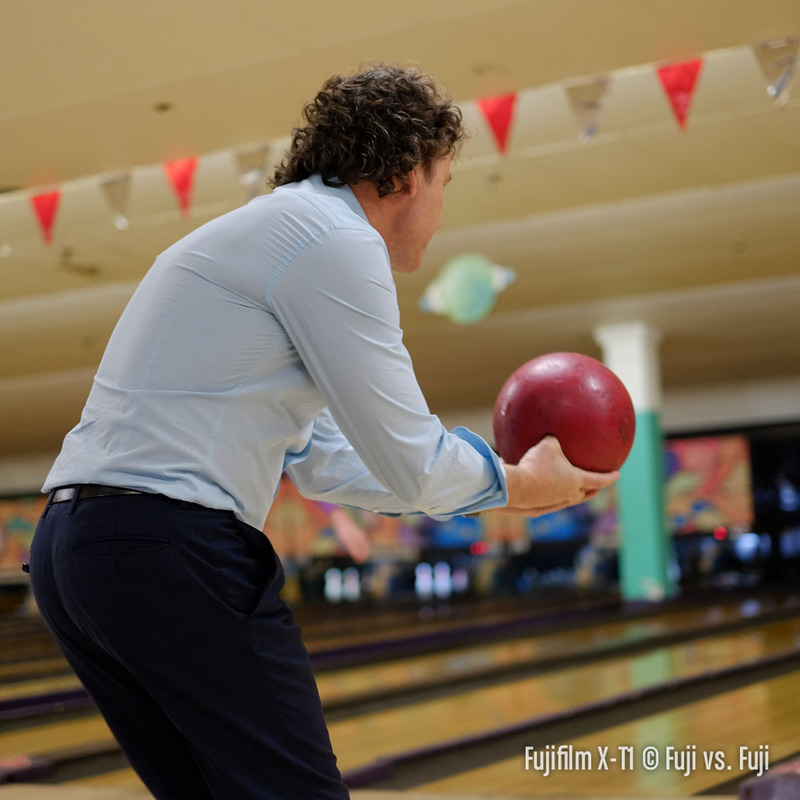 It becomes difficult, if not impossible to keep a focus point on a small moving object like a bowling ball rolling off into the distance. 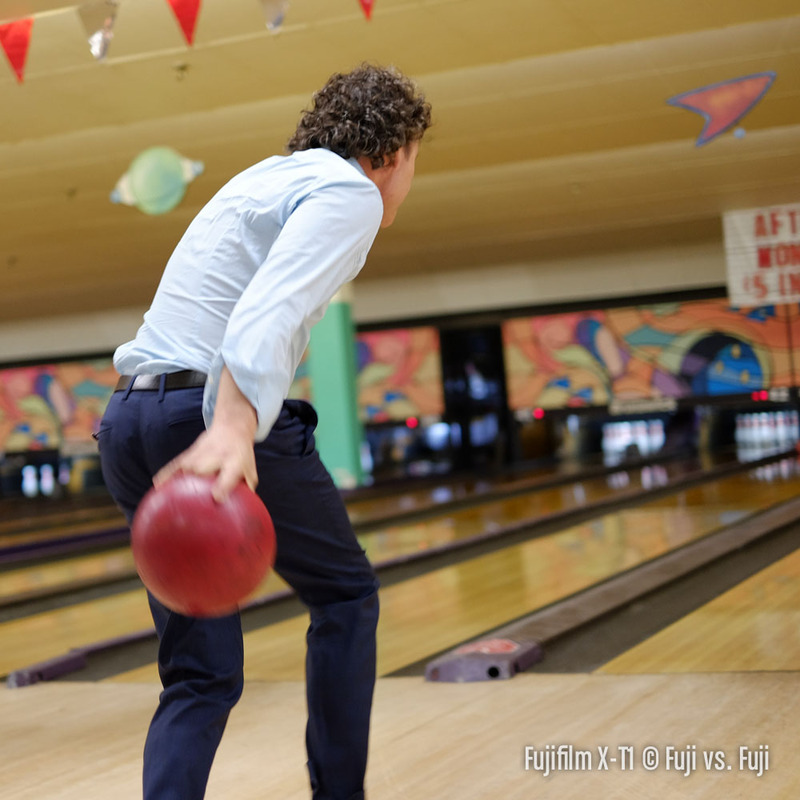 The X-T1 has very little trouble tracking a person moving left to right, towards camera, or away from camera. Occasionally it will lose track of your subject, but often only for a single frame (again, out of 8 per second), and then it grabs your subject again. Other times, if there’s an extremely high contrast scene in behind the subject, the camera might lock onto that as it thinks that’s the thing you’re trying to photograph. My D700 was tricked by difficult scenes like this so I’m not complaining. Had I been tracking a soccer player with a park or stadium in the background, I don’t think the X-T1 would have had any trouble at all. To be perfectly honest, I think I may have chosen one of the most difficult situations for a camera to stay locked on the subject I’d like. The background was full of brightly-coloured high contrast things that cameras love to focus on. Below are some examples of continuous autofocus tracking. 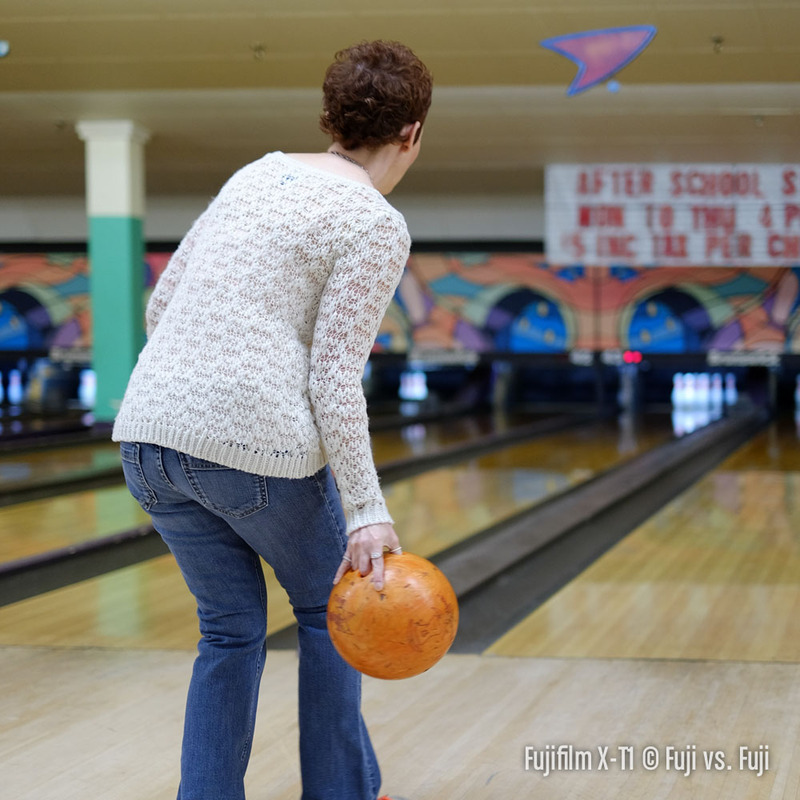 These were shot with a combination of the 56mm f/1.2 and the 35mm f/1.4 wide open or at f/1.4. 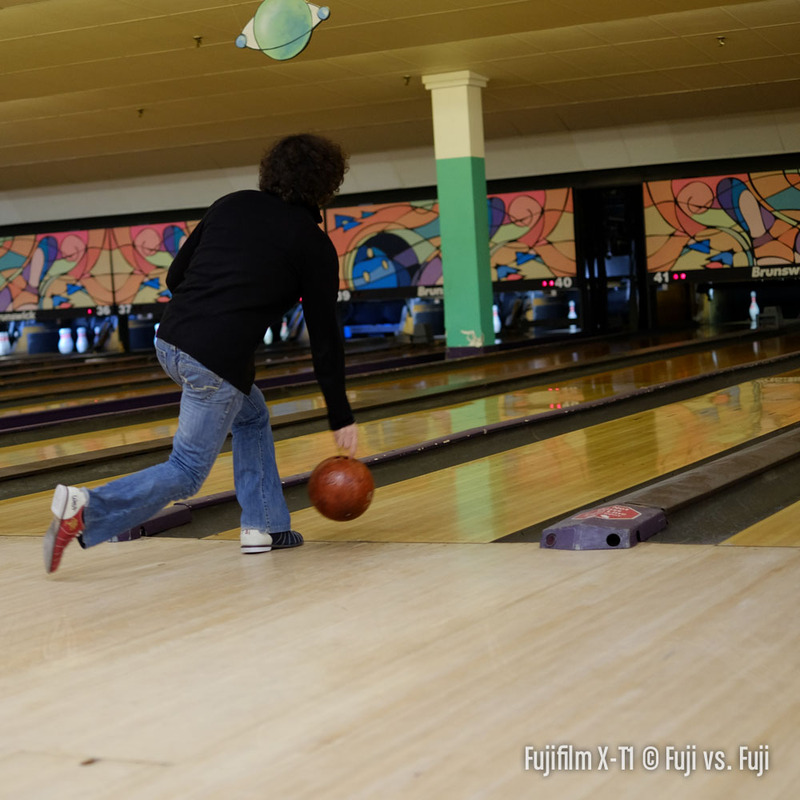 In this first gallery, you’ll notice the camera has locked focus on the ball, looses it, but then picks up again. This is 3 images from a larger sequence. The next gallery demonstrates the cameras ability to track subjects moving away. 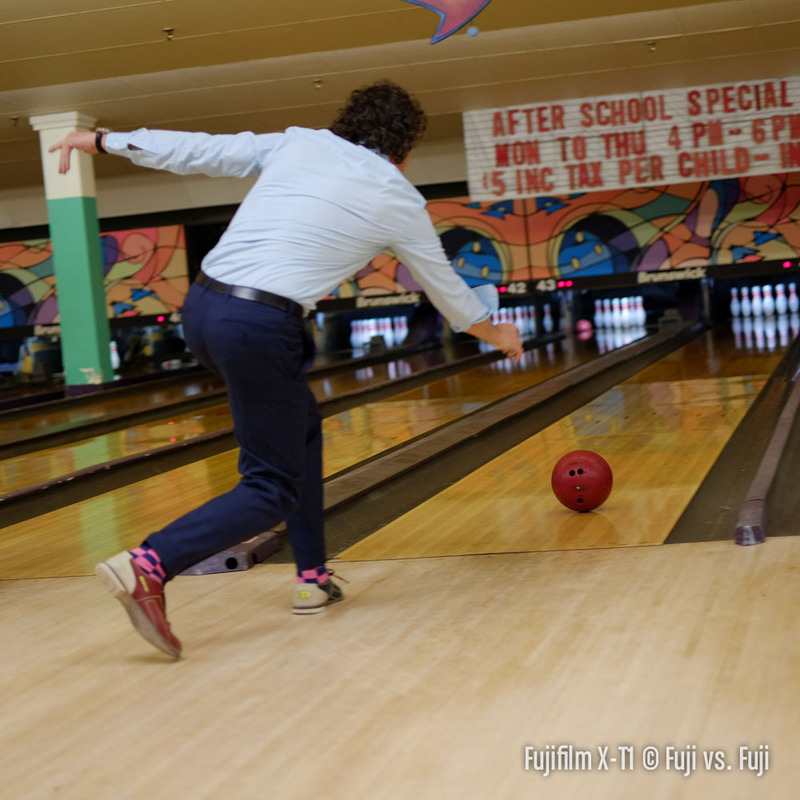 I was even able to track the ball fairly well. 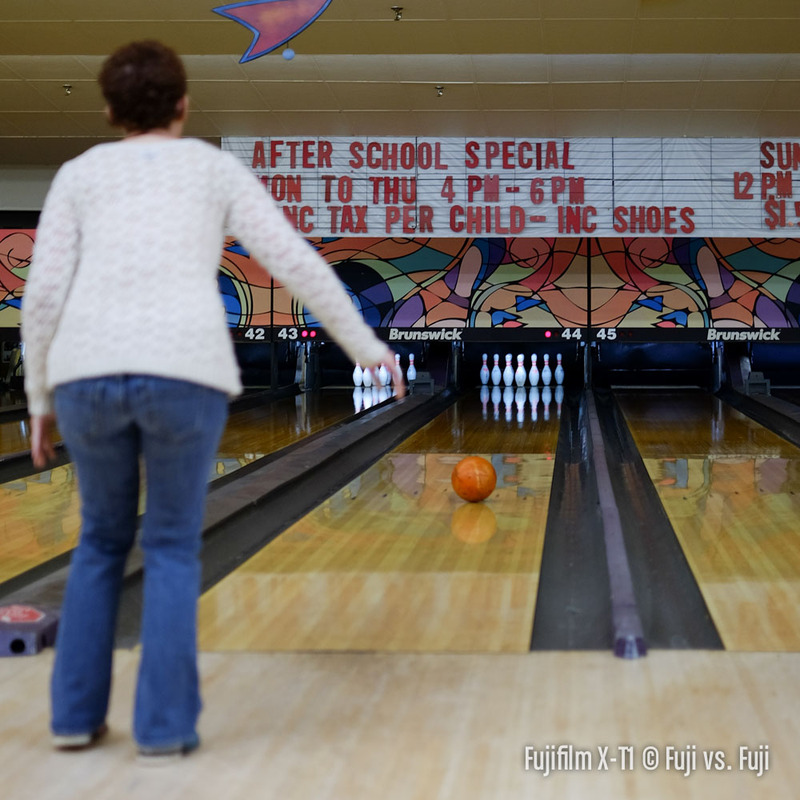 There are a couple frames where the X-T1 focuses on the background, but who could blame the it for wanting to focus on that marvellously colourful and contrasty wall art, and the gleaming white bowling pins. 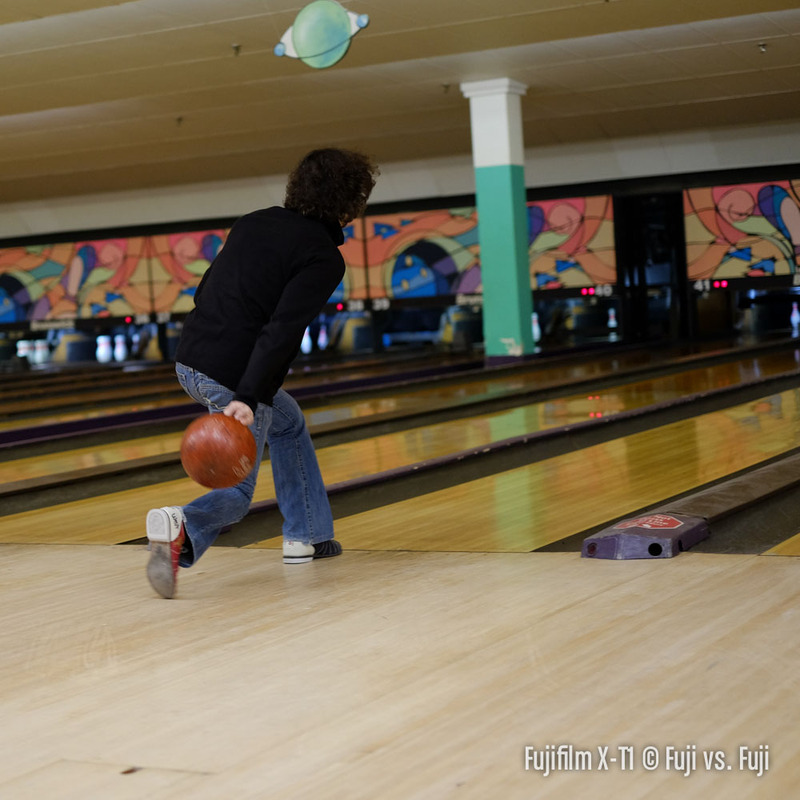 I was able to pick up the ball again by the last frame. Here we have a combination sequence of moving away and across the frame. The camera was smart enough to ignore the woman moving from behind to the left of the subject, and only had one error frame (bottom left) where it locked onto the background. 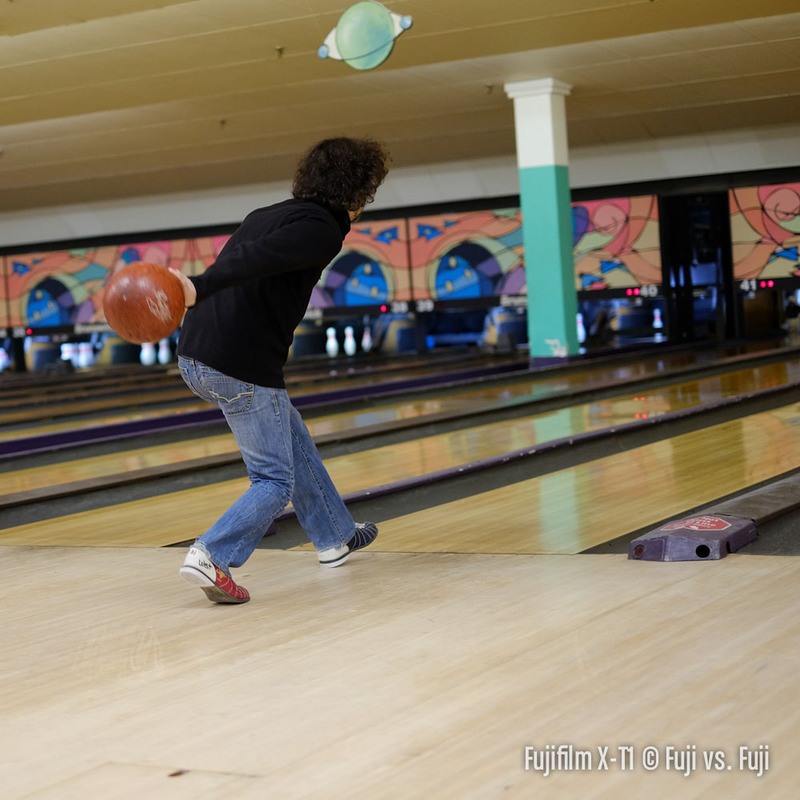 It’s actually impressive that the camera is even able to shift focus from about 2 meters to 8 meters in ⅛ of a second. Next is an example of tracking the ball. Success with tracking something so small in such poor lighting isn’t guaranteed, but that it’s even possible is impressive. What can I say that hasn’t been said already? The Electronic Viewfinder on the X-T1 is outstanding. It’s big, bright, and the refresh rate is fantastic in all but the lowest of light. The EVF has 2 modes in autofocus and 3 in manual. The key difference is the focus distance scale is overlaid on the image in “Full,” rather than appearing below the image in “Normal.” It’s so unobtrusive, I had to cycle between the two modes a couple times to see what was happening aside from the preview getting smaller in Normal. Eyeglass wearers will definitely appreciate Normal mode as the entire frame is more easily visible without crushing your glasses and face against the camera. For those who can get by with diopter adjustments, I’m not sure why they would choose Normal over Full when autofocusing unless there is something critical in the bottom of the frame. For the manual focuser, a third “Dual Mode” is available. I imagined a second picture being laid over top of the entire full-size frame for a picture in picture effect, but in fact it’s side-by-side pictures. You get a reduced picture of the overall scene with a small, zoomed crop of your focus point for focus confirmation. It works great. One thing that has perhaps slipped past other reviewers is the response time of the live exposure preview. In bright conditions, there have been times when I turn my X-E2 on, remove the lens cap, and then wait a brief moment for the live exposure preview to go from totally blown out to something that’s accurate. On rare occasions, I’ve been frustrated by this delay. With the X-T1, the delay has been reduced. This means being able to go from camera off with lens cap on to taking a photograph in even less time. The rotating EVF is very helpful and it seems so obvious that this is how EVFs should work. Fortunately, it’s an instantaneous change rather than the iOS-like animation from landscape to portrait as it appears in the promotional video. It’s really easy to get used to this and once you have, the non-rotating screens of the previous cameras becomes really apparent. I want this EVF UI on all my cameras. Lastly, back to lowlight, as I sit here comparing the EVF capabilities of the X-E1, X100S, X-E2, and X-T1, the X-T1 is almost like wearing night vision goggles. 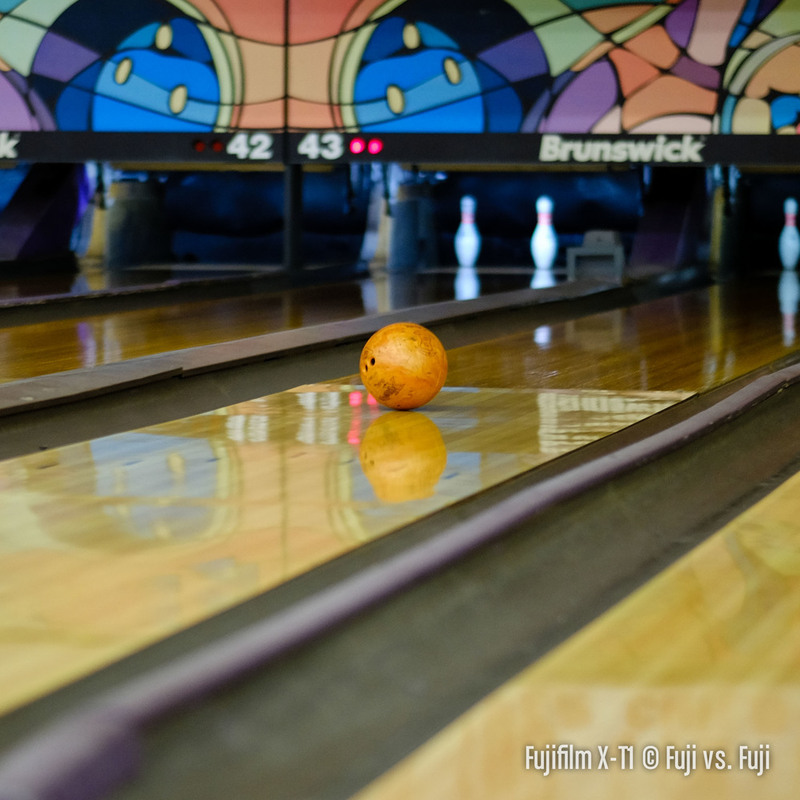 There are still drawbacks to an electronic vs. an optical viewfinder, but even the staunchest of OVF fans would have to concede that in low light, no OVF could come close to letting them see what they’re shooting like the EVF in the X-T1 does. It’s astounding. 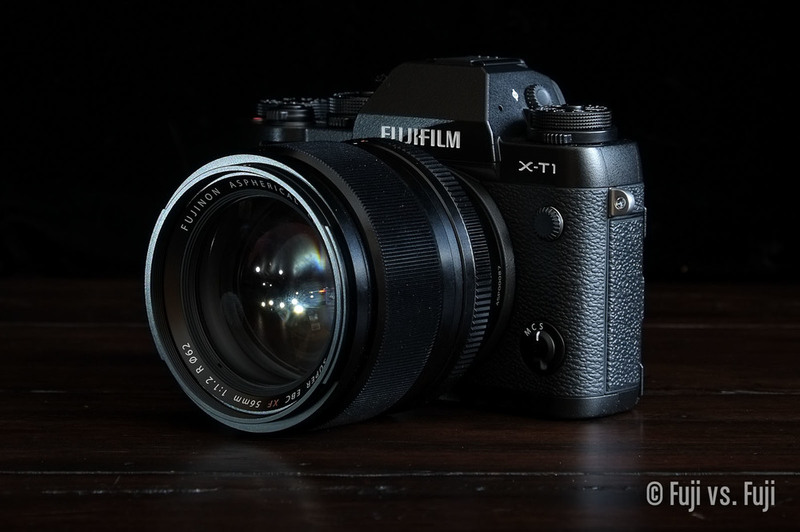 If you’re a nighttime street shooter, the X-T1 is the Fujifilm camera to get. The improved lowlight autofocus performance combined with an EVF that literally let’s you see in the dark is worth the cost to upgrade alone in my opinion. The LCD’s refresh rate is also incredible. You can hold the camera in front of you, and twist your wrist side to side and observe very little, if any lag. The tilt function has already come in handy for more discreet photography and lower perspectives. Unfortunately, the LCD lacks the fancy rotation of the EVF. Hopefully this rotation will make an appearance on the LCD with future cameras. I’m not sure it’s the sort of thing that can happen with a firmware update. I intend to spend a fair bit of time on the ergonomics and handling of the X-T1. These are areas that are really important to me. As an example, Sony’s A7(r) wasn’t even a consideration because of how awkward it is to pull ones index finger back towards them in order to depress the shutter release. It has RSI written all over it. Because of this, I was a little worried about this all-new body design. Based on all the leaked specs, I was sure I would want the camera, but if it was uncomfortable to hold or operate, my excitement would have dwindled. Fortunately, Fujifilm have taken a great deal of care with respect to the ergonomics of their latest entry. When I first got my hands on the X-T1, I was overjoyed with the extra grip and how it felt in the hand. It is fantastic to hold. As time goes on, I appreciate the new body design more and more. Without any additional grips or attachments, the X-T1 is the best-feeling X Series camera to date. It feels “sure” in the the hand. With my DSLRs, I didn’t the need to use a strap outside of the convenience. 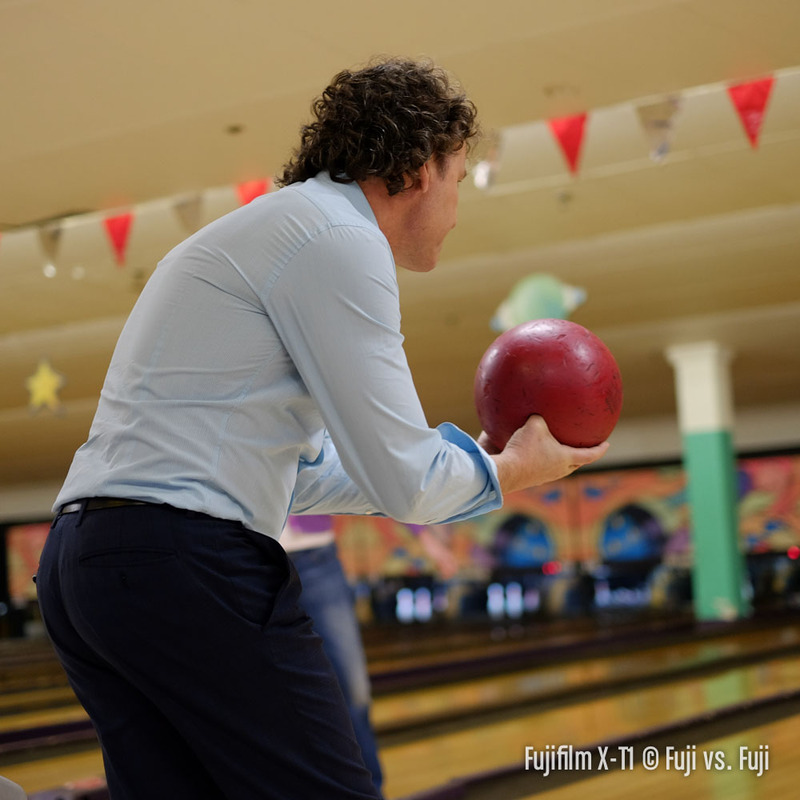 The added grip kept it feeling steady in my hand, and I didn’t feel worried about dropping it. With rangefinder-style cameras like the X100S and X-E models, a wrist strap is almost a necessity. They feel like they could slip or be knocked out of my hands at any moment. In this way, the X-T1 is very much like DSLRs. Now, when it comes to holding the camera to actually shoot, the improvement is somewhat diminished for me. That’s not to say the shooting ergonomics are poor, more that the shooting ergonomics of the X-E bodies and X100S were already pretty great. One-handed operation is serviceable on all three cameras. It’s probably least on the X100(S) for me, and about equal between the X-E and X-T bodies with the weights of the two bodies accounted for. Handling might be the biggest change from previous X Series cameras to the X-T1. It’s a complete overhaul. From the viewfinder location to the tilting LCD to the abundance of new dials an Fn buttons. Time to pick things apart. I already gushed about how amazing the new EVF is, but the next biggest change after the specs is its placement. Gone is the rangefinder-style layout. Now we have a centred DSLR-inspired EVF location. For left-eye shooters, the relocation of the EVF shouldn’t matter a ton beyond subjective preference. For right-eye shooters, the change could have a real affect on usability if you’re the sort that keeps your left eye open while shooting. I’m happy to take the added dials and switches along with the new EVF location, but it raises an interesting point to ponder with regards to the X-Pro1’s successor. Could a dual OVF/EVF appear in this new central location? That would give the X-Pro line a very different look. Or will the X-Pro forego the dedicated ISO dial? Time will tell. I’m surprised more people aren’t talking about the front and rear dials shown in pictures of the all but confirmed X-T1. These will almost certainly make a huge difference in how we use the camera. ⅓ stop increments on shutter speed: When shooting with a user-specified shutter speed, it can be fine-tuned using the dial as you have it set in the menus, front by default. The other dial does nothing from what I can tell. Playback: During playback, the rear dial zooms in on images while the front dial cycles through them. Using the dial to zoom on the X-T1 takes a lot of turns to get the image zoomed right in (reminds me manually focusing the X100 pre-firmware 2.0). For now, I’ll use the Focus Assist button to zoom in to 100% and then zoom out with the dial if needed. Sadly, these two functions can’t be switched yet. I would prefer to cycle images with the rear dial and zoom with the front, partly because that’s what I was used to, but also because I think it’s more intuitive. Navigation: And lastly, the dials can be used to navigate the camera’s menus. It’s a good first step, but it can be taken it a step further. In addition to using the rear dial to scroll through menu items, the front dial should be used to drill down through sub menus. This can make navigating the menu really quick once you’re used to it. Hopefully Fujifilm will add this in a firmware update. Shutter release: As I hold the camera the pad of my index finger falls perfectly on the shutter release. The button doesn’t feel the same as most of Fujifilm’s X Series cameras. It looks very similar to the shutter release found on the X-M1. The button seems to float a little within the power switch housing, but depressing it to focus, and then further to release the shutter is nice and slightly less spongy then the X-E or X100S shutter releases. One pretty majpr gripe, there’s no screw hole for a soft shutter release. I like having a soft shutter release in my Fuji cameras to get the shutter release where it’s most comfortable. I’d have no trouble living without it, but it’s a preference. Being able to use a mechanical cable release would also be nice. I find the cameras Fujifilm decides not to include a screw hole in a little confusing. Currently it’s available on the X-Pro, X-E, X100, and X20, and not the X-A, X-M or X-T lines. Up until that last one you’d think it was just consumer cameras that didn’t get the screw hole. Ah well. Power switch: This is also a little different from the X-Pro, X-E and X100 cameras. I like it better. The little grip on the switch is more grippy and easier to flick on and off with gloves which makes sense for a camera that’s resistant to cold. The click is more satisfying, and feels more solid. Exposure Compensation Dial: I love how large the dial is. Thankfully it goes to ±3 stops like the X-E2 does. It stays in place despite not having a button to release it. It’s good. Shutter Speed Dial: Another upgrade in terms of size. I’m also very pleased I can finally turn the dial from “Bulb” to “Automatic” without having to spin the dial all the way round. Fortunately, the button-release that prevents accidental changes is only engaged with the dial is set to Automatic. That would have gotten real frustrating, real fast if it engaged throughout the whole dial. ISO Dial: A dedicated ISO dial! Excellent. I personally will likely only use Automatic ISO and ISO 200 for the most part. Maybe ISO 400 and 800 on occasion for increased dynamic range. In this case the button that releases the dial works the whole way round so you can be sure you won’t accidentally change your ISO. H1 and H2 ISO are configurable. Not sure why you’d choose ISO 51,200, but you have the option. Drive and Photometry (Metering) Dials: The Photometry dial is a little tough to get at, but it works well otherwise. The Drive dial is very accessible, easy to adjust, and difficult to change accidentally. Great. 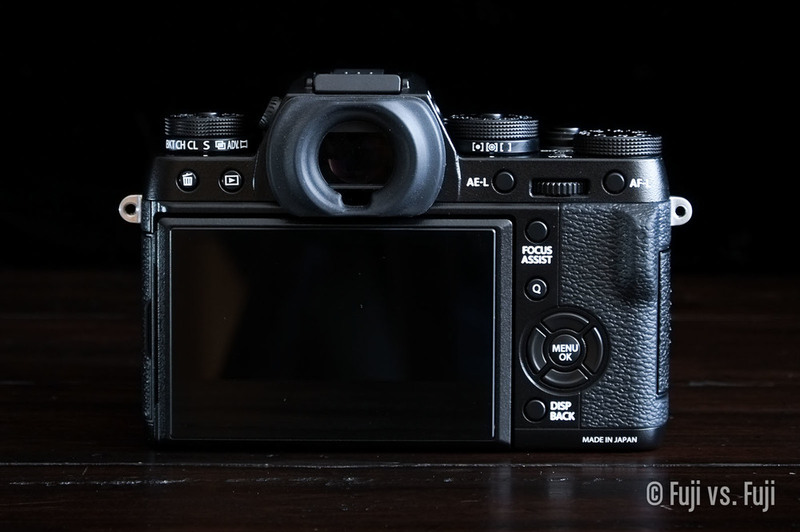 Focus Control Switch: It’s in the same place as the X-E bodies, but slightly harder to change. No big deal. Front & Rear Dials: These turn exactly as I expected them to. Nice and clicky. The front dial is a little easier to turn than the rear, but they’re both excellent. Their placement is also superb. I can comfortably keep my index finger on the shutter release and turn the front dial with my middle finger. I love it. The rear dial is easily reachable with my thumb, but again, doesn’t turn quite as easily because less of it is exposed. Return of the View Mode: I still miss this button on my X-E2. Glad to see it return. D-pad: Here’s where things get ugly for me. I can sort of understand the reason why, but the buttons on the the D-pad are pretty bad. They’re small, squishy, soft, and can take multiple tries to press. The top and bottom buttons are a little better than the left and right, but none are good. I can only surmise the reason they’re like this is because when you grip the camera tight, the part of your hand where the palm meets the thumb presses right up against it. This could easily result in accidental button presses. I don’t know what the answer is, and Fujifilm have definitely chosen the lesser of the two evils here, but these buttons just aren’t great and they’ll be used often. The middle MENU/OK button is butter than the surrounding buttons, but it too isn’t great. 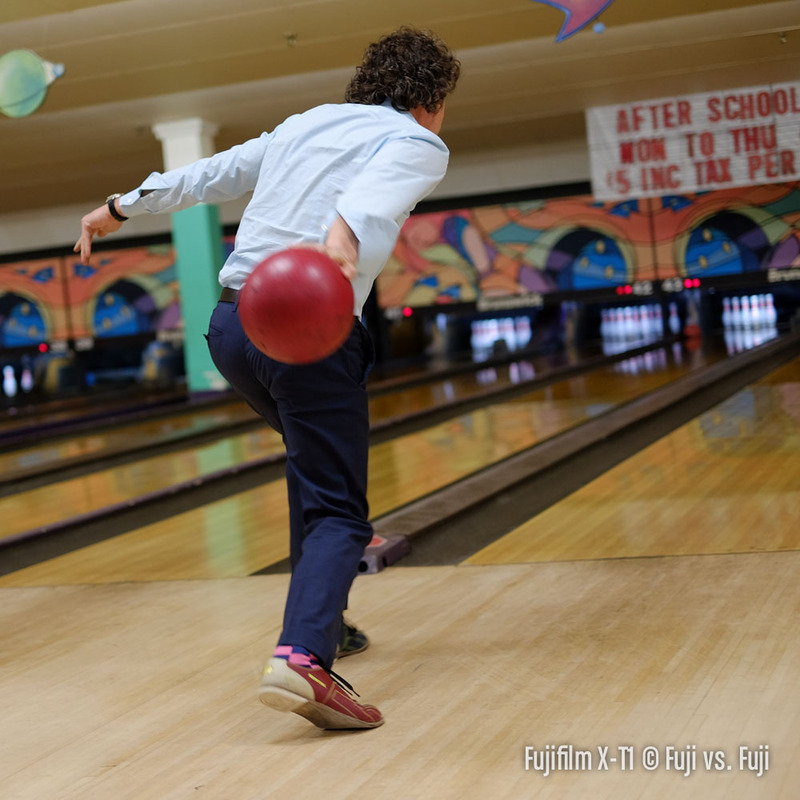 Compared to the X-E cameras, the X-T1’s D-pad isn’t even in the same league. UPDATE: This issue has largely been resolved. Other Buttons: All the other buttons are significantly more pleasing to use. The only usability problem I’ve run into is on all of Fujifilm’s other bodies, the white text is usually directly on the button. I’ve become so accustomed to pressing where the writing is that I’ve found myself poking the “DISP/BACK” text a number of times and then had to feel around for the actual button, particularly in dimly lit shooting conditions. This is something I’ll surely get used to, but from a consistency point of view, it isn’t. The front Fn button is perfectly placed, but the “Wi-Fi” button is terrible. The position of “Focus Assist” and the “Q” button make perfect sense. Overall though, the buttons are kind of all over the place. The “Record” button is well placed, just as the Fn buttons that appeared in it’s place were before it. It would be great if the Record button was also configurable. I’d prefer not to have recording set as an option, and I’ve already accidentally recorded a bunch of half-second videos. Diopter Adjustment: The diopter adjustment is good. Nice and clicky. The X-E2’s is a little easier to use. That’s beyond nitpicking though. PC Sync Connection: This is fine. That cover will be lost by more than a few X-T1 owners I’d wager. The X-T1 supports UHS-II high-speed cards. This is sure to be a boon for burst-shooters. I personally rarely set the Drive dial to Continuous so I’m not the right person to write a lot of commentary on that. Write speeds to the card do seem very fast. I think the fastest UHS-I cards have throughput to spare when using the built-in reader in my MacBook Pro so I can’t comment on read speeds. The SD slot is on the side for the first time on the X-T1. The spring-loaded slide out door feels nice, opens and closes well with a satisfying click. I talked about the quality of the buttons on the D-pad above, but the huge improvement made over all the other X cameras to date is every one of these buttons is customizable. I’m still getting the right options in place, but once I do, I’ll have many more controls easily accessible. I’m really happy about this feature. Odds are, I’ll mimic the button configuration of the X100S for consistency. It’s the only camera body that put the AF point selector in the right place, in my opinion. In addition to the 4 customizable buttons of the D-pad, there’s a new front Fn button. This button is very well placed for me. Currently I have it set to Film Simulation Mode, and I use my middle finger on the front or rear dial to cycle through. This is great for changing my film simulation without taking my eye from the viewfinder or my index finger off the shutter release. One option that’s missing from this function button is the ability to temporarily change my photometry (metering) to spot. I’d love to be able to push and hold this button, meter off something specific, shoot, then switch back to my regular metering mode once the button is released. Next firmware update, hopefully. And in case you missed it above, I’d really like the Record button to be a configurable Fn button. The X-T1 has an excellent feel to it. 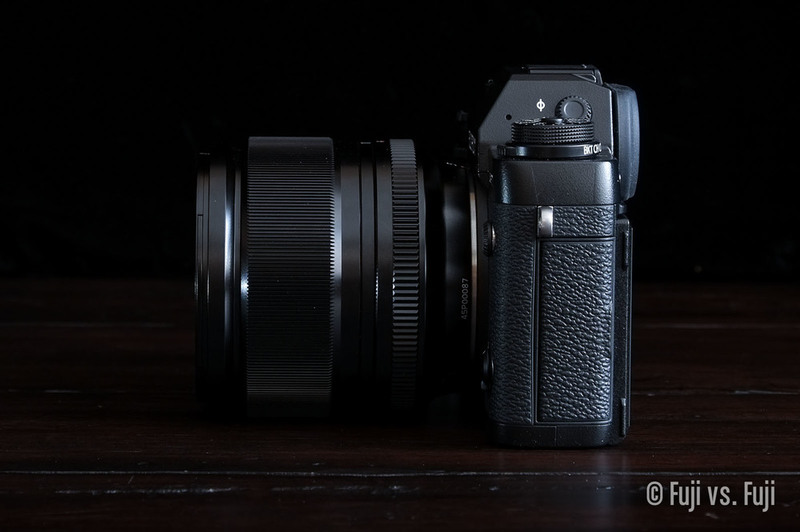 The magnesium body gives a substantially more premium feel than the X-E cameras have. It feels like it could take more abuse than the other X Series bodies as well. It doesn’t feel quite as dense as the X100S, but it’s pretty close. The added heft of the X-T1 allows for heavier lenses to balance well on it. 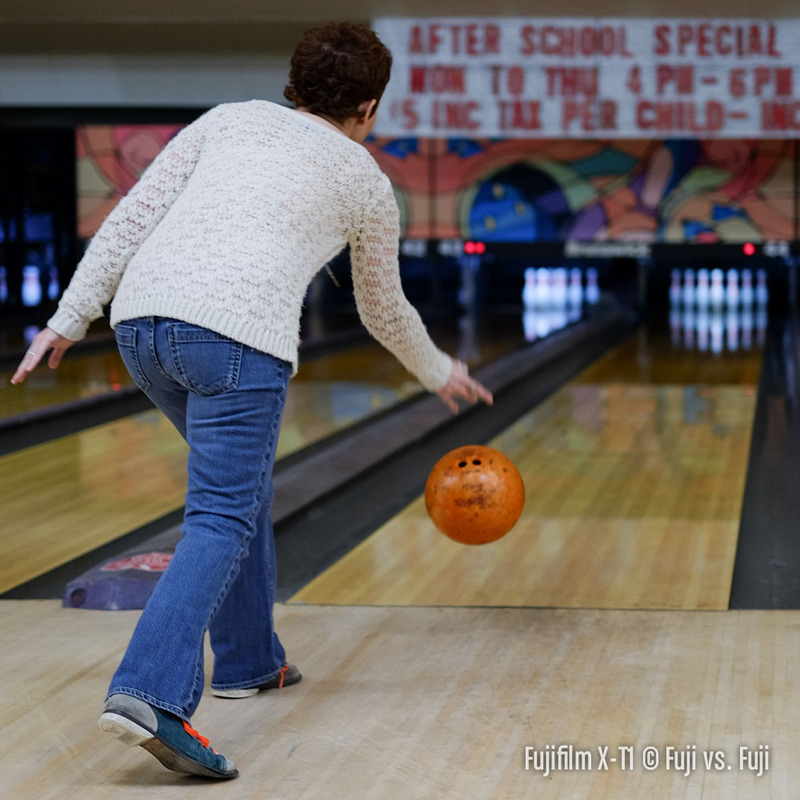 Strangely, the 56mm f/1.2 seems to balance slightly better on an X-E camera than the X-T1 when shooting, despite the X-T1 feeling so much better to hold. Focus peaking in colour is great. It will be particularly handy for people who compose in black and white. I seem to have much more success with focus peaking when it’s set to “Low”, but on occasion, adjusting it to “High” may make it more visible. The obvious next step for Fujifilm is to make it intelligent so that switching between High and Low is unnecessary. Quibbles aside, I’m able to get extremely accurate focus, even with high-speed glass, focusing manually. That’s as much thanks to the dual screen mode, which I like more the more I use it. As luck would have it, a grip was sent my way just today by the fine folks at Fujifilm Canada. I’m pretty excited about this as I really wanted to test out the ergonomics of the grip while shooting portrait. There is one huge, glaring problem with the vertical grip. It feels better in the hand than the camera’s built-in horizontal grip. The standard grip is already a huge improvement in terms of how it feels in the hand, and the vertical grip is another step forward. It feels perfect in my hand. Of course this is totally subjective. My wife prefers the feel of the horizontal orientation. Otherwise the grip feels very solid on the camera. No creaking or movement when torquing it back a forth. There’s an extremely small amount of play in the front middle of the actual grip, but it’s hardly even worth noting, and could be because this is one of the few demo units Fujifilm have on hand. It’s likely seen some abuse. The grip is also weather sealed which is nice. The front dial feels as good as the one on the body. The rear dial feels a little better than the body equivalent. It’s a little easier to turn. The shutter release feels the same and the Focus Assist (FA), Exposure Lock (AE-L), and Focus Lock (AF-L) are all as good as their horizontal counterparts. One minor positioning niggle, it would be nice if the buttons were in the same arrangement in vertical and horizontal orientations. It could take some thought when switching back and forth. Once something a little heavier like the Fujifilm XF 23mm f/1.4 is on there, you’ll need to lean the camera. This image wasn't captured with a Fujifilm camera, but it’s awfully nice to know it soon can be. Images like these might be the only thing I was missing when I made the move to Fujifilm. 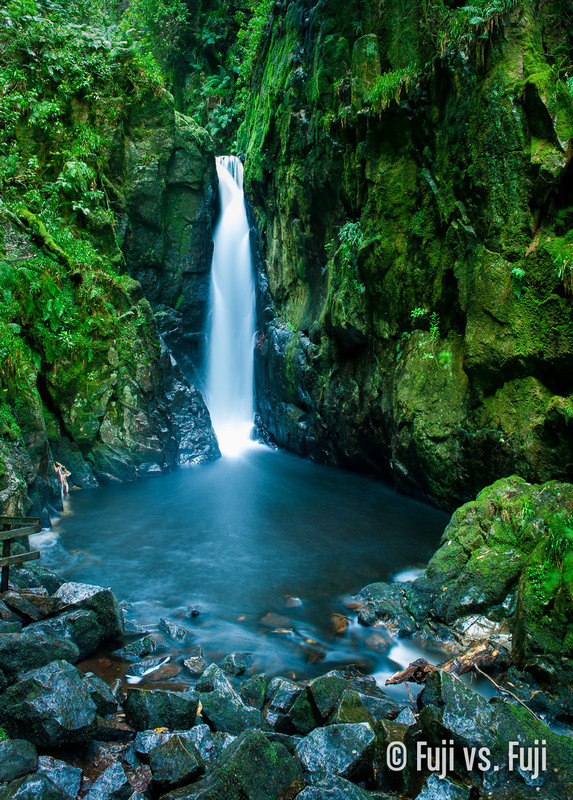 Setting up a tripod in front of a waterfall in the pouring rain of the UK simply wasn’t a good idea. The X-T1 promises to remedy that, I think. Fujifilm are very conservative with their language surrounding what their cameras can endure. All their other X Series cameras to date, for example, cite a minimum safe operating temperature of 0˚C. I’ve had three X cameras in well below -20˚C, even -30˚C on occasion, and I’ve never had an issue. So I can only imagine the minimum recommended operating temperature of -10˚C for the X-T1 is also conservative. This brings me to water. Everyone remembers the videos of people taking a garden hose to their new Nikon D3. The D3 didn’t skip a beat. Fujifilm seem nervous to put their cameras through similar endurance tests for now, but seem confident that their weather sealing equals “the other guys.” I can only assume that I’ll be able to capture that shot of a waterfall in the rain with my X-T1 when the day comes. Sadly, that day won’t be here until around May even though the X-T1 is due to hit the streets towards the end of March (in Canada). That’s because none of Fujifilm’s existing lenses are weather sealed and won’t be until the Fujifilm XF 18-135mm f/3.5-5.6 comes out. As an aside, this does leave me wondering about Fujifilm’s kit choice. 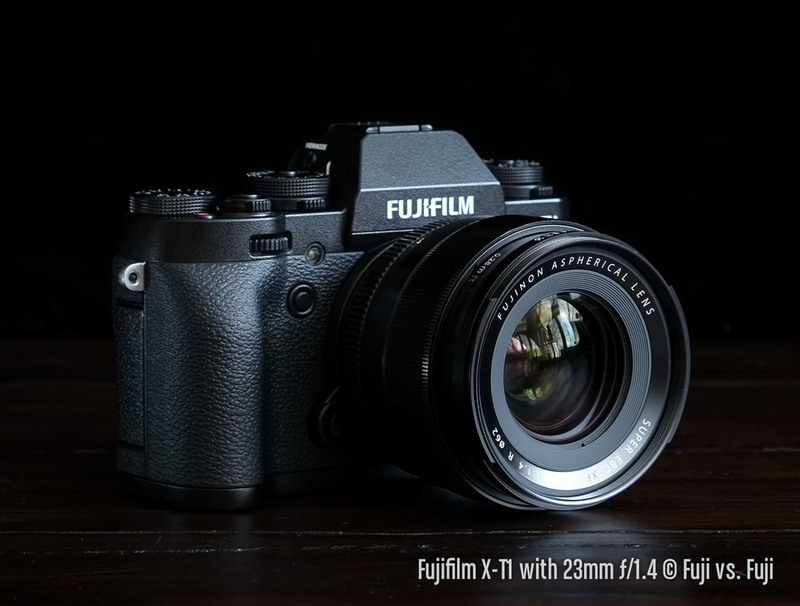 Why package the weather sealed X-T1 with the Fujifilm XF 18-55mm f/2.8-4 which is not weather sealed? I guess they want people to be able to get started with a lens as soon as possible, but I can easily see less informed photographers knowing they have “a weather sealed camera” and being disappointed to find out that didn’t include the lens. Either after they purchase it, or worse, when they send their new kit zoom in for repair. Anyhow, the good news is, a Fujifilm body that can withstand the elements will be here soon and three zoom lenses, one consumer, two pro, will follow soon after. I can easily see myself vacationing in the UK with only the X-T1, and that 16-55mm f/2.8 once it comes out. Looking forward to it. The included flash is a nice little surprise. It’s one of Fujifilm’s “Super Intelligent Flash” units, similar to the one found in the X-E2, but with a higher guide number of 11 at ISO 200 (vs. 7 on the X-E2). Based on a down and dirty test, it doesn’t appear as though the “intelligence” has increased. Getting the flash up even higher helps with shadows caused by lenses though. With that added height and power comes an increase in size, but this flash is still wonderfully compact, folds down nicely, and can easily be slipped into a pocket. It’s a real shame the flash can’t be used on other X Series cameras. I wouldn’t be sad if this is the direction Fujifilm took all their included flashes in. I accidentally set the aperture to f/2 in the second shot, compared to f/1.4 in the first. With all the critiques, I might have given the impression that I’m not that happy with the camera. I am being very hard on Fuji with this review. One thing that is important to keep in mind is these critiques are made with pro DSLR bodies in mind that cost twice as much or more when they were released. Is this fair, and have Fujifilm even claimed the camera keeps pace with pro DSLRs? Heck no, but that is that bar mirrorless cameras are constantly going to be measured against. 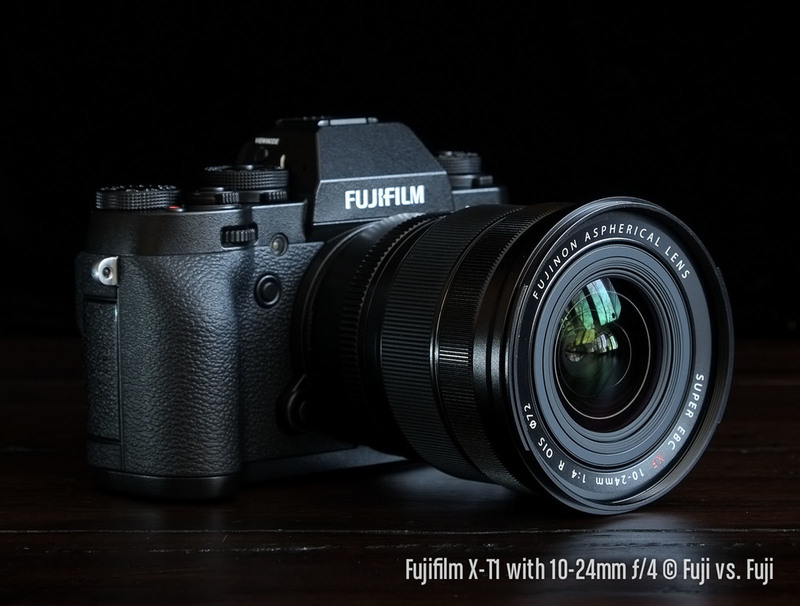 Make no mistake, unless budget is a concern, the X-T1 is the Fujifilm camera to get if you’re buying new. It might even be the camera to get if you already have an X-E2. I know of at least two people who are looking to trade up from X-E2’s. If I wasn’t running this site, my body lineup would be the X-T1 and a black X100S. I’ve been relishing these past few days having those bodies along with my “Ultimate Prime Kit” in my Billingham. Sadly I’ll have to wait a little while before I can pack that kit again. I can assure you though, it will be packed as soon as possible. I have little doubt that 2014 is going to be a very good year for Fujifilm. That will definitely be driven by the excitement around the X-T1, and the new FUJINON lenses, the XF 56mm f/1.2 and, to a lesser degree (strangely), the XF 10-24mm f/4. This means there will be no shortage of new fans to the world of Fujifilm. I hope this review will help these new entrants make as informed a choice as possible about which is the right camera for them. For those already in this world, you’ve probably already decided the X-T1 is the next step. It is must-buy for any Fuji fan who shoots in poor weather, in low light, action, or all of the above, and it’s the camera to buy for serious photographers looking for a compact system. I can’t wait until my preorder comes in.